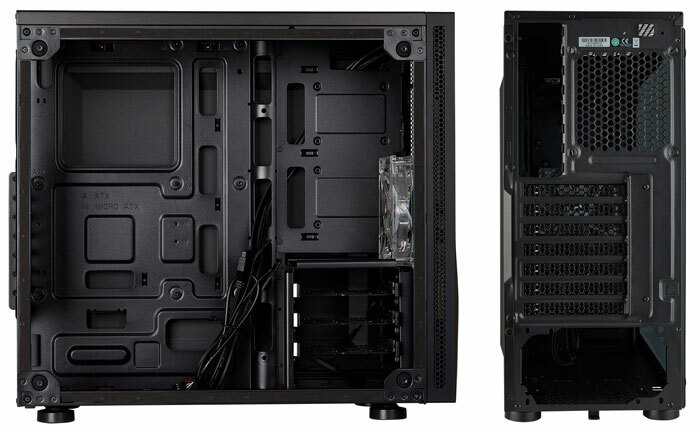 Corsair has quietly unveiled a new Carbide family, value mid-tower chassis. The new Corsair Carbide SPEC-05 Mid Tower PC gaming case is listed on various online retailers here in the UK with imminent availability - towards the end of this week. 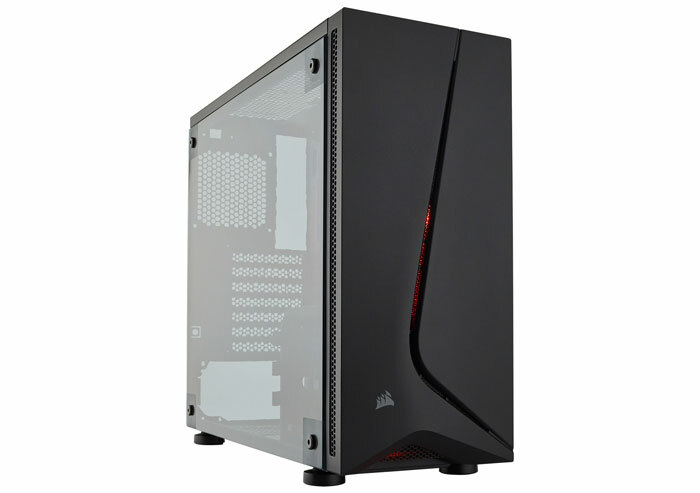 The Corsair Carbide SPEC-05 mid-tower offers an understated appeal with its matt black steel smooth edged design. The front features a hockey stick shaped intersection which is an air intake and through which you can see the glow of an internal 120mm red LED lit fan (included in price). Providing higher-end looks is a full transparent side panel which is acrylic but affixed in a way that mimics tempered glass designs. Out last observation about the exterior is that the I/O is situated along the top front edge and features (left to right) a recessed power button, USB 3.0 port, USB port, headphone socked, mic socket, and reset button. Inside the 199 mm x 483 mm x 433 mm (WxDxH) 4kg mid-tower you should find ample room for expansion with 7 expansion slots. With respect to cooling there is room for either 3x 120mm fans or 2x 140mm intake fans in the front, 2x 140/120 mm top exhaust fans, and a 120 mm rear exhaust fan. The case is alternatively compatible with various radiators of 120, 140, or 240mm in size such as supplied with the Corsair H55, H60, H75, H80i, H90, H100i LCS. Removable dust filters are fitted to keep the innards clean. Component storage capacity isn't great but should be ample for most with room for 3x 2.5 and 2x 3.5-inch drives. On the topic of capacity, the SPEC-05 has maximum compatibility of 370mm for GPUs, 150mm for cooler height, and 180mm for PSU length. Cable routing cut outs and tie-down points make for a clean build with uncomplicated airflow. The Corsair Carbide SPEC-05 looks like it will be available by Friday, according to the listing at Scan Computers. There it is priced at RRP, of £49.99. In other regions the chassis is priced at US$49.99 or €55. Not keen on the unhappy expression the front panel is sporting. Tell me they're not allen keys holding the side panel in place,sigh. I have their Obsidian 450D case and clean dust out of it once a week, taking off the side panel via two nice and simple rear thumbscrews, which is essential as the PC sits on the desk right next to my monitor. Having to fumble about, in and around my monitor with Allen keys in each corner would make this task a HUGE pain in the backside. Only one USB3.0 port? In 2018? There's budget cases with USB type-C for rubbishrubbishrubbishrubbish's sake. Heh, this is one of the reasons I love my LianLi case, one thumbscrew, pull out catch, take out side panel. Honestly it's one of the smartest design decisions I've seen on a case for side panels (without being tacky).